For cycling enthusiasts one of the great joys of the sport/pastime is that if you love the Tour de France you can a) buy a bicycle similar to the one the pros use and b) go out and actually ride the same roads of “la Grande Boucle” that they do. And of course not just the roads of the next edition but pretty much all the roads since 1903. The Anjou VéloVintage event in 2013 included a section of the final stage of the 1903 Tour between Angers and Saumur, luckily making it only 90+ kms instead of the insane full 471 kms from Nantes to Paris of the original. But I thought then how nice it would be to have a book showing maps of each year's Tour so that you might be able to put together your own ride into history. 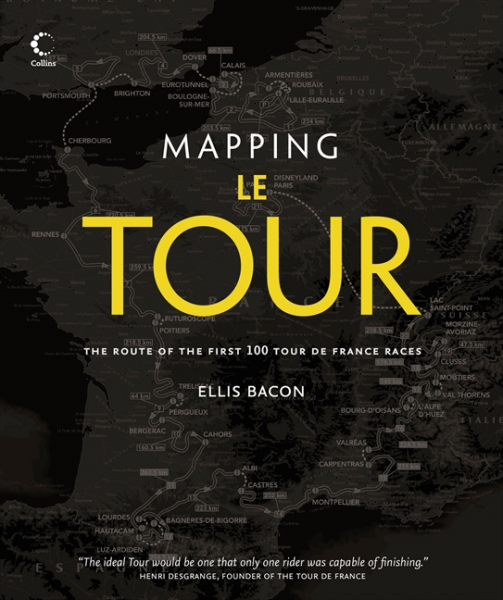 It turns out that in fact 2013 saw the publication of “Mapping Le Tour: The Unofficial History of All 100 Tour de France Races” by Ellis Bacon. This nicely-produced book is an excellent information source for Tour enthusiasts and offers a logical progression of each and every edition of the race, usually spread over two pages. 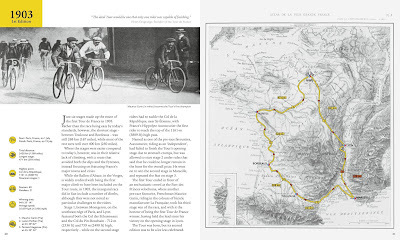 The left-hand page, heading by a period photo, is where one will find the text describing the race that year, and includes some key statistics for easy reference, such as the number of starters and finishers, the distance ridden and the average speed for the winner, the longest stage and highest point as well as the podium winners. The right-hand side offers a full page map of the route with the route as a yellow line marked into stages and showing major cities. 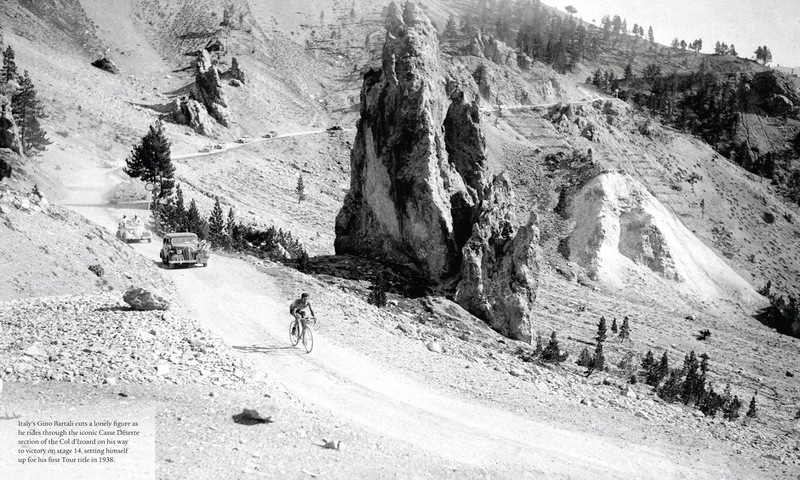 I learned that the while the Ballon d'Alsace was credited as the first major climb of the Tour (appearing in 1905), the inaugural 1903 race included a number of climbs (with the highest point at 1161 m) but these were not seen as particularly challenging—although one would think that racers on fixed gear super-heavy bicycles with terrible brakes would find any climb challenging. It may have been fairly flat but that first race featured some crazy stage lengths, with the shortest being 268 kms while most of the rest were over 400 kms each. No wonder that of the 60 starters only 21 made it back to Paris. While the text is concise and interesting, I enjoyed just looking at the maps even more. The Tour began as a huge circle, heading clockwise around the hexagon that is France but taking some care to avoid the Alps and the Pyrenees but rolling through major cities. By 1905 the previously-mentioned Ballon d'Alsace appeared and the winner was declared on a points system rather than time. The winner, Louis Trousselier, apparently gambled all his winnings away in a single evening in Paris playing dice. He never won another tour but seems to have set a precedent for nicknames for French cyclists, being called Trou Trou (see “Pou Pou,” “Dudu,” et al.) although Henri Desgranges christened him “the Florist” due to his family business. By 1906 the race went outside of France for the first time into German-held Alsace and in 1907 included a section of the Paris-Roubaix course (on a stage won by Trou Trou). It was 4,488 kms spread over 14 stages, compared to 2428 kms in the first race (over only six stages). For the next few years the race seemed to more or less follow the same route but things really changed in 1910 when the Tour divided into the Pyrenees, inlcluding the Portet d'Aspet, Col du Peyresourde, Col d'Aspin, Col du Tourmalet and Col d'Aubisque for the first time. The next year the Alps showed up, providing climbing thrills on the Col du Télégraphe, Col du Lauteret and the huge Col du Galibier: seven mountain stages in a race covering (gulp) 5,344 kms. The climbs that would become legendary in Tour history were now part of the regular itinerary and in 1913 the race finally went around France counteclockwise, although it would be many years before the regular annual switch (clockwise alternating with counterclockwise, or Alps before Pyrenees and vice versa) would be instituted. Curiously, for a good part of its history the Tour avoided the central part of France, rolling around the country's periphery and avoiding the Massif Central. The was to change in 1951 when not only did Mont Ventoux show up on the route for the first time but the race did not start in Paris but rather in Metz and the race has not started in Paris since then except in 2003. Clemont-Ferrand was on the Tour route, deep in the heart of the Massif Central and not only home to Michelin but also the centre of French bicycle manufacturing. In 1952 the Alpe d'Huez and the Puy de Dôme were added, the same year that Fausto Coppi won five stages on his way to winning the overall race by nearly 30 minutes. The maps are very interesting but the scale is unfortunately too large to be of much use in planning a stage-specific reenactment on your own but would be a useful general guide. 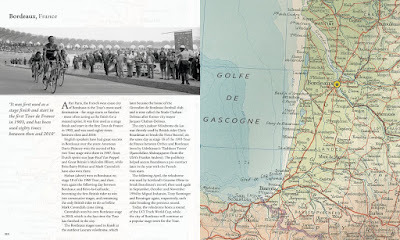 The photos are well-chosen and the final sections of the book provide a preview of the 2013 Tour (the 100th Edition) but also a series of chapters on “the Tour's Most Memorable Places.” These include not only the famous climbs but celebrated cycling regions such as Normandy and Brittany. Every region in France has been covered by the Tour and more than a few foreign countries have been visited. Excursions into the Italian Alps have been pretty common (and will take place again in 2016) and the Tour has not only gone to its immediate neighbours, including Germany, Belgium, the Netherlands, Andorra, Spain, Luxembourg but across the Channel several times to the UK and even Ireland. The author includes the memorable Grand Départ in London in the book but also, for non-British readers, waves the Union Jack a bit too much. The inclusion of the Tom Simpson incident in the 1967 chapter is right and proper and it is nice to mention Barry Hoban, whose eight Tour stage wins were the most for a British rider before Mark Cavendish but eight wins is half as many as our somewhat obscure Trou Trou won. 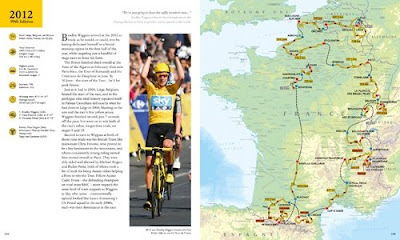 The worst example of Little Englandism is the remark in the 2011 chapter that “Bradley Wiggins' yellow jersey was still a year away...” but this is easy enough to overlook, along with the fact that Wiggins did not even finish the 2011 race as he crashed out in Stage 7, breaking his collarbone. There is a revised 2014 edition of the book, only in paperback, that was produced to include a preview of the 2014 course which began in Yorkshire so the publishers were probably not looking much at the global audience. “Mapping Le Tour” is highly recommended even for those with an extensive Tour library. The geography of the race is what makes the Tour de France the great sporting event it is and this book would make pedalling backwards through time possible with a bit of effort. Maybe I will yet take down the steel Peugeot PXN-10 with its Simplex derailleurs, put on my black-and-white checkerboard team jersey and head eastwards from Nantes through Touraine on the long road to Paris...well, probably not in one day.